The community kite fly this past weekend was canceled because of too much wind. Most people do not understand that you can have too much wind which results in broken lines and broken kites. And there is a portion of us flyers that do not like being dragged down the beach by a kite. Instead of flying, I set myself an impossible project – to build a train of five kites by the time the Carolina Kite Festival occurs. This gives me six days. 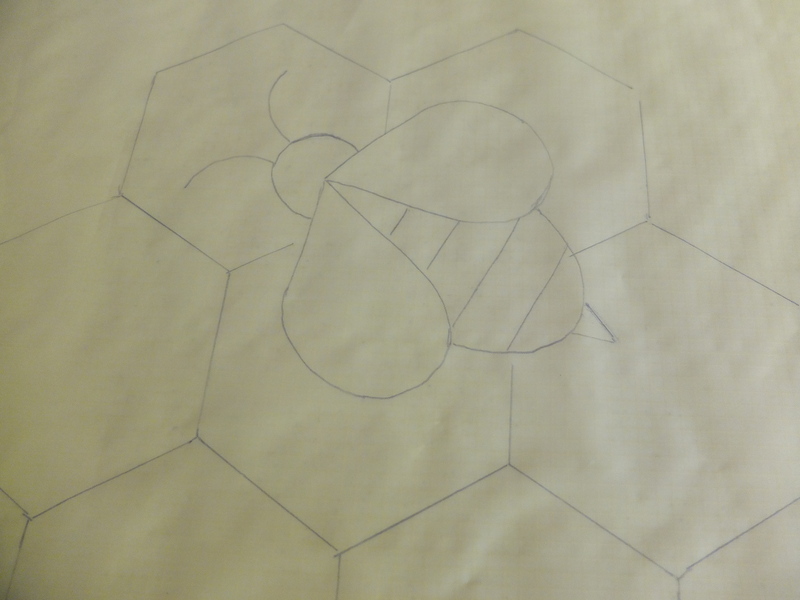 The kites I plan on building are a variation of a plan I saw online. I’ve changed the kites outline, am using fiberglass instead of bamboo and adjusted the flat kite with a dihedral to give it some bow. I have no idea if this will work. 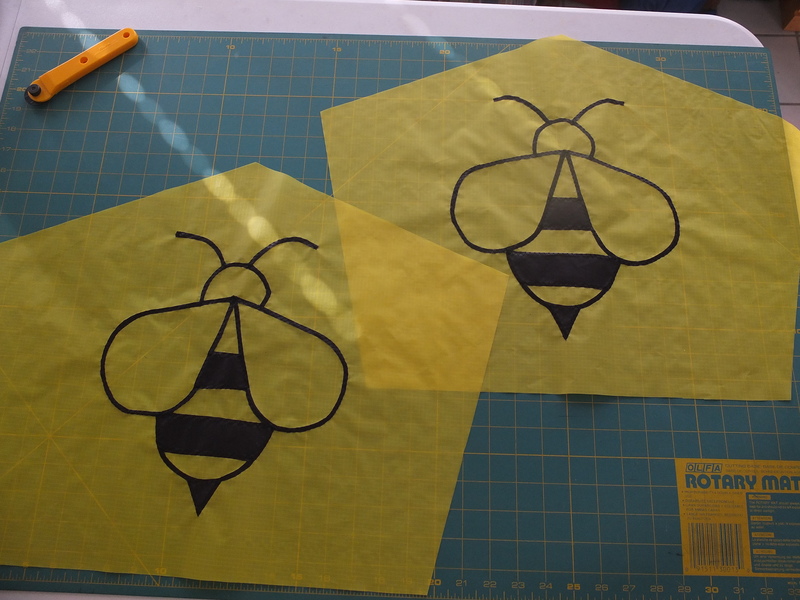 The kites will be yellow with black appliqué. The patterns come from some images I found on the Internet. The kites are small, five-sided and meant to dance around in the sky. They will be ultimately flown on a single line with branches out to the side so they can move without entangling each other. 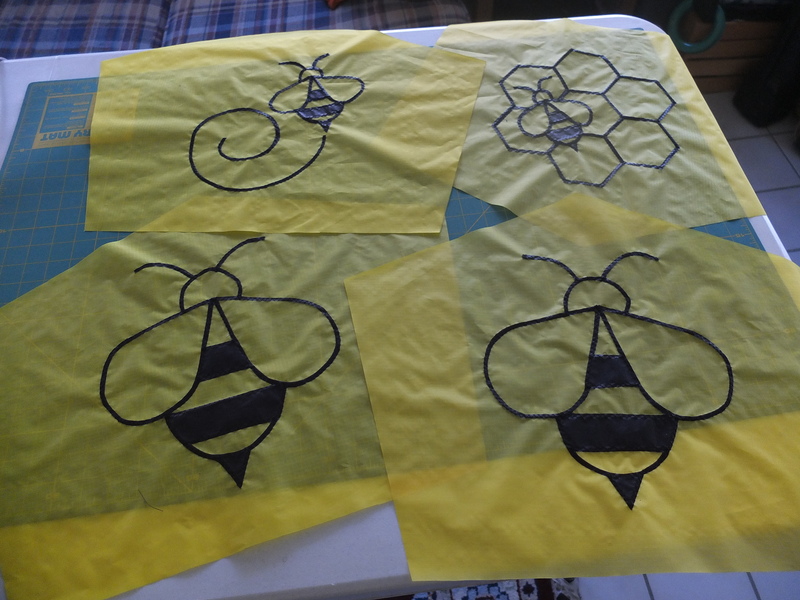 Four different designs are appliquéd on the kite skins. They are enlarged using an opaque projector to a size that will fit the kite. The theme is honey bees. 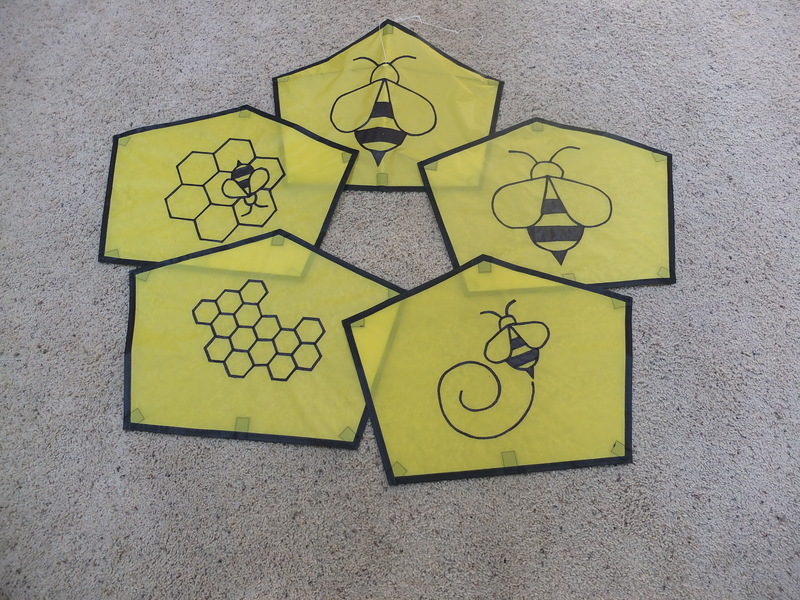 So the first and middle kite will be a single large bee. It actually took only two and a half days to get all the skins stitched. The designs are rather simple so that made things easier. 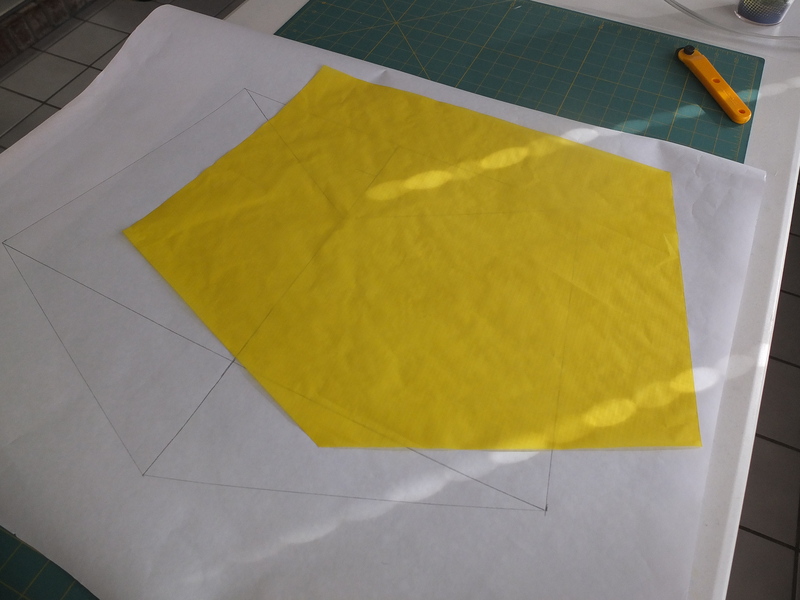 The next step was to decide to hem or to edge bind. 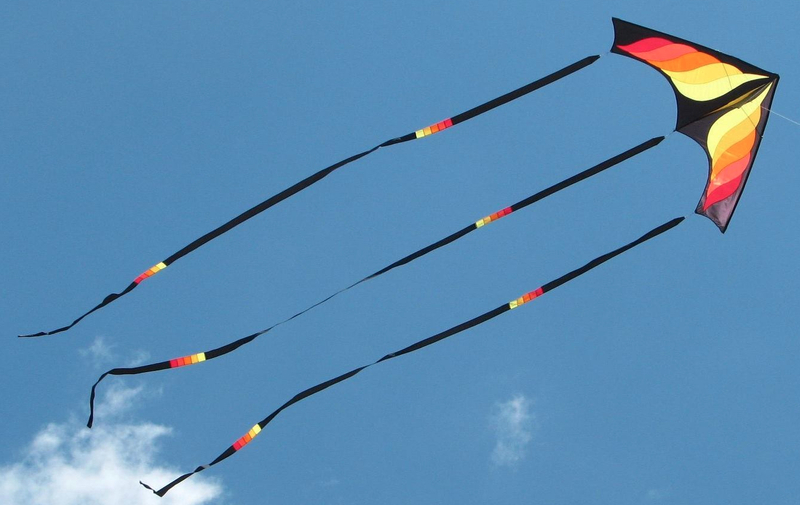 Edge binding gives the kites a black outline which will set them off in the sky. And then there were six pockets to sew on each kite to hold the fiberglass rods which form the frames. Pockets take longer than anything when making a kite. Especially when there are special folds to make each pocket fit closely in each corner. I framed one kite and tried to test fly it before doing all five kites. The winds were terrible so a good test flight was impossible. But I did find out that tails will probably be necessary. So I spent one evening making zig-zag tails. These are similar to a fuzzy tail and provide more drag than a simple straight tail. They are also easier to make than fuzzy tails. There still is framing to do on four of the kites. My job for tomorrow. And I’m planning on doing some more test flying between tomorrow’s rain showers. Here’s hoping I get it all done and they fly well for the upcoming festival.